I'm sorry for this post coming up later than anticipated, I have been away on holiday in Dorset enjoying the last bit of summer and have had no wifi. Week 6 has consisted of making hearty meals at home and also making sure I was prepared for my trip by making my own breakfast cereal, by not forgetting my homemade ketchup and by packing ingredients like stevia and rice syrup to help me stay sane when my family inevitably all decide to have ice cream. 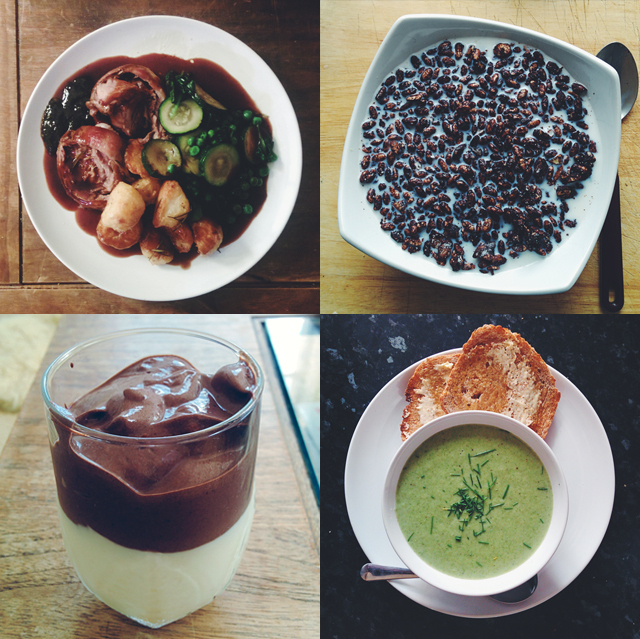 Whilst at home it has been a bit chilly, so I have been embracing more autumnal food. I decided to make a lamb roast dinner, but started fretting about having to miss out on mint sauce. I had a bash at making some off the top of my head and it actually turned out pretty good, so watch this space for a recipe coming up in the near future. I also ate meals like sausage and mash with gravy and veggies, trout and salad with parmentier potatoes and pasta with veggies and mozzarella. I also had egg and soldiers and porridge for a few of my breakfasts. Lunches included sandwiches using bread made with my bread maker and a variety of salads. I was only in Dorset for the last couple of days of Week 6, but whilst there I ate some lasagne, sugar-free waffles with bacon and of course, fish and chips! Roast lamb, rosemary and garlic roast potatoes, courgettes, peas, spinach, homemade red wine gravy and homemade sugar-free mint sauce. Homemade 'chocolate', nutty granola with milk. Layered sugar-free chocolate and vanilla yoghurt made with natural yoghurt, cocoa powder, vanilla and stevia. Homemade leek, spinach and potato soup, with sugar-free bread made in my bread maker. Water, wine and fruit tea. I was away when I would have weighed myself and there were no scales where I was staying, so this week is unknown. A combination of delicious food and sea air left me feeling really energised and relaxed. I have been waking up consistently early and have generally felt pretty happy and content. I'm sure that being on holiday helped considerably, but it was definitely a change from morning sluggishness that I would have normally had whilst away. It was a shock for me and my family that I was the first up and dressed most days! I haven't desperately craved anything sweet, considering the exposure to things like ice cream and clotted cream fudge, which is anything short of a miracle. I'm feeling increasingly more positive that once this sugar detox is over, I will still be able to continue eating low sugar food and not feel like I am going to go off the rails on a chocolate binge. I feel so much more in control of my emotions and don't feel like they are being dictated by what I eat anymore. I'm so happy that you feel your body is finally used to a low sugar diet :) It's crazy how much what we eat can affect our emotions, isn't is!? The food looks delicious!